The energy, the connection between the seeker, the reader, and the cards, this is something really special. A private reading with me, Lori of Inner Goddess Tarot, will give you the chance to explore your question in depth, and find empowering and constructive suggestions for your next steps in life. Think about it…what do you most need to know right now? Do you want to deeply understand your true path in life? Is it time to improve your relationships, career choices and overall level of happiness? 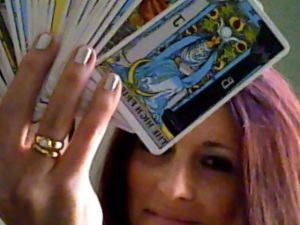 A private Tarot reading with me will help you to find empowering answers and peace of mind. You will leave the session feeling lighter, more positive, and confident about going forward in life. During your reading, you have the opportunity to ask a specific question, or to simply let the cards tell you what you most need to know at this time. My collaborative and compassionate approach will help you to look within yourself and find clarity, while enjoying a meaningful and enjoyable Tarot experience. I read Tarot on a very flexible and accommodating schedule at my Toronto Healing Arts location, see information below. I am also available at Wonderworks every Tuesday, information can be found here. We can also connect by SKYPE, no limits of geography or time zone! I felt much lighter after the reading, more alive I would say. It gave me a more positive perspective and hope. Thank you. Thank you so much for such a detailed reading. It really resonated with me even though it wasn’t something I wanted to hear. It’s definitely realistic.You described me perfectly. This reading will serve as a great advice. You are a really talented reader.